When we were here in Cuenca in December 2012, we enjoyed this restaurant near the Old Cathedral near Parque Calderon. Have you ever had a dish in a restaurant that really stood out, so that you’re thinking “I would really like to try that again”? 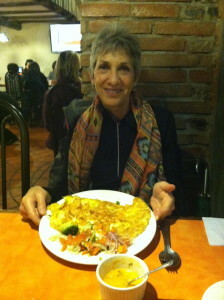 Raymipampa serves typical Ecuadorian food, including this shrimp omelet. I just love it. Simple, plain, tasty and perfectly prepared. Yeah – 15 percent is too little these days if the service is really great. I think 20 percent should be the new standard for great service; 15 percent for average; 10 percent (and possibly a word to the manager if the service puts the restaurant at risk of losing patrons).